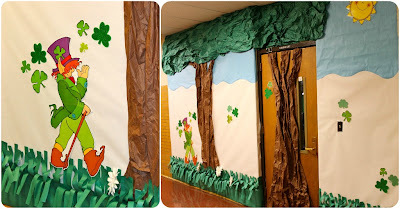 A peek at last week...St Patrick's Day! 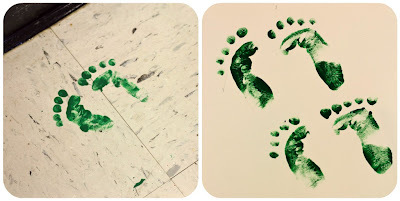 A leprechaun visited our classroom, played tricks on us, and left foot prints everywhere! He left silly messages and one day asked if we could "catch" his rainbow. So, we tried! 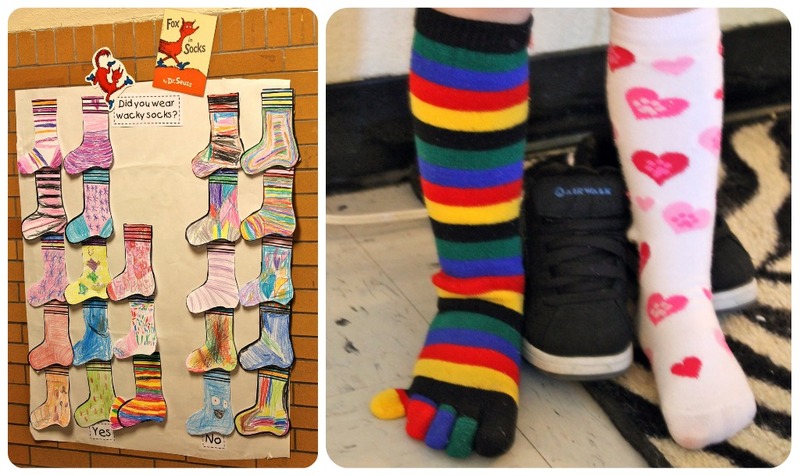 This great experiment was from DeAnna's unit. 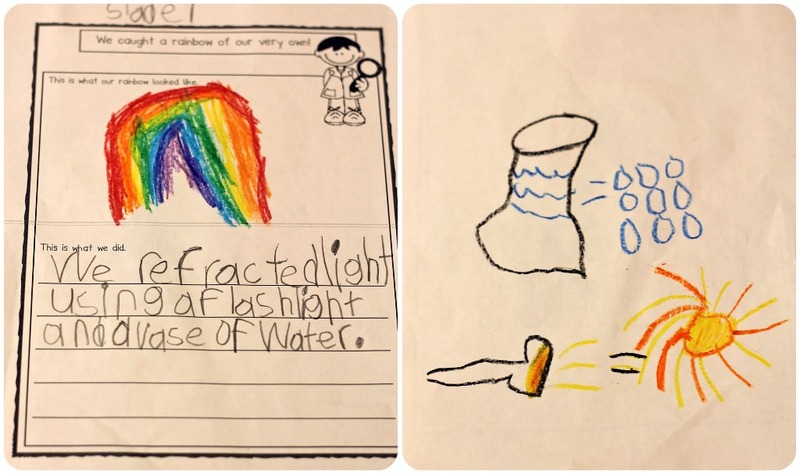 We refracted light using a flashlight and vase of water. 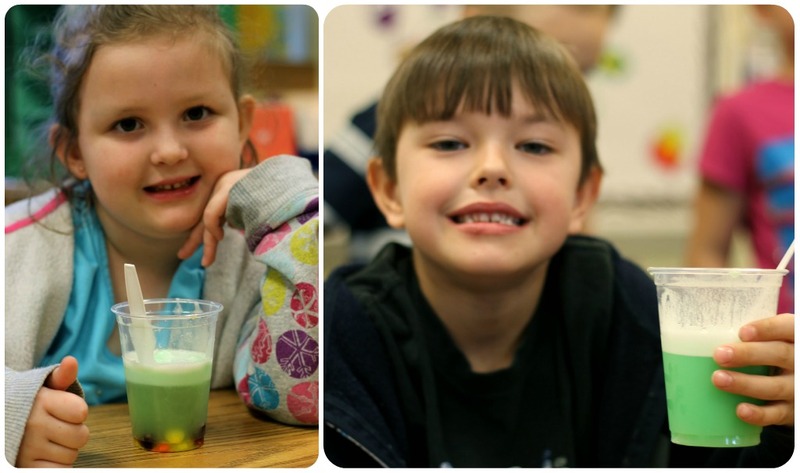 We turned off our classroom lights and students looked around the room and tried to find the rainbow. Students learned that to make a rainbow, you need rain and sunlight. So, on the back of our paper, we made a key to illustrate what each object we used represented. 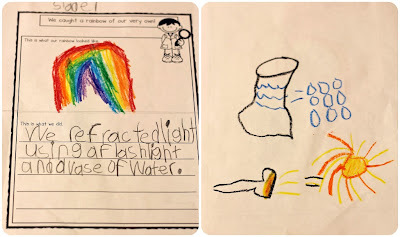 Key: the vase and water = rain and the flashlight = the sun. 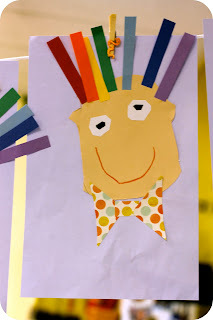 We learned about the colors of the rainbow and made our own Roy G. Biv. 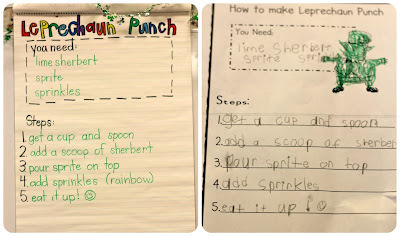 We made Leprechaun punch one day and added rainbow sprinkles (skittles)! 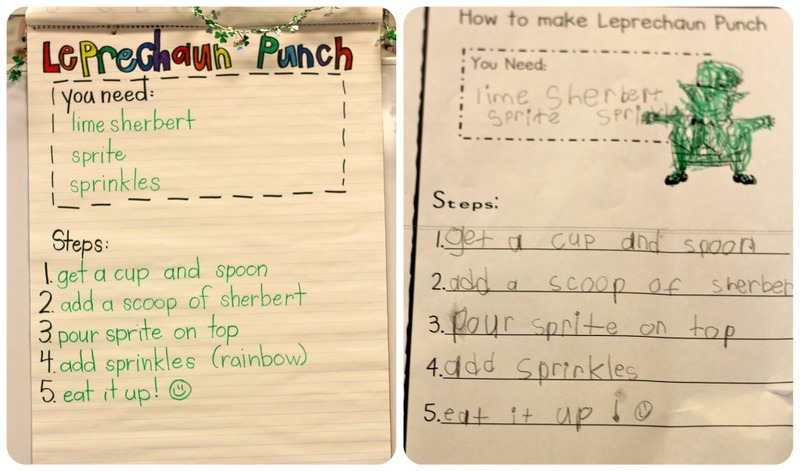 Students did a little "how to" writing and wrote the steps we took to make the punch. The last step, "eat it up" of course! 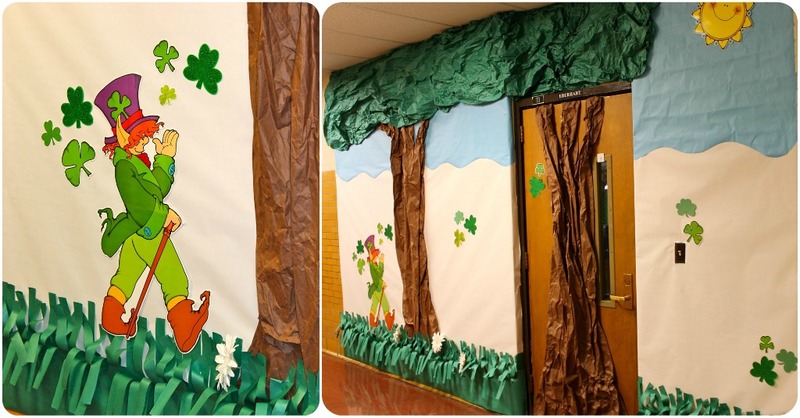 Here is what the outside of our classroom door looks like! I didn't get a chance to grab a picture after we added our huge pot of gold. But you can imagine it...right next to the door, in between the trees. 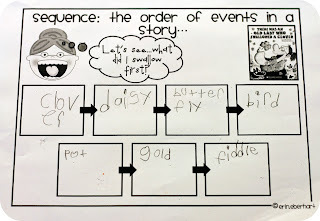 We learned about the sequence of a story and read There was an Old Lady who Swallowed a Clover. 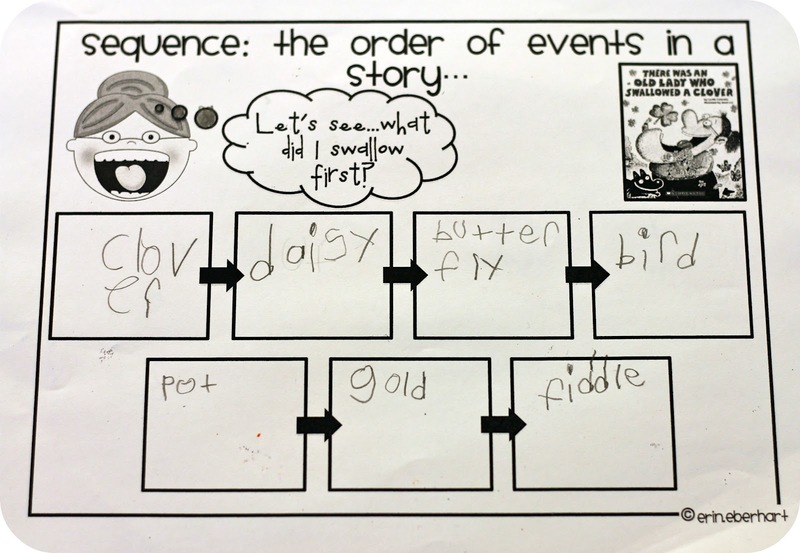 Students re told the story and listed the objects the old lady swallowed in order. 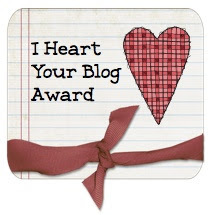 You can grab this freebie and a few other goodies to store away for next year below. Hope you had a Happy St. Patrick's Day! 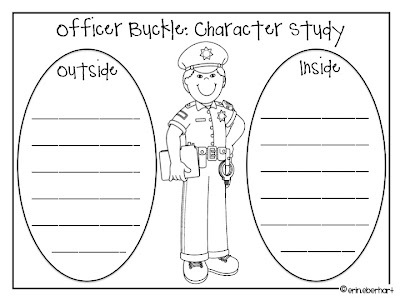 Character Analysis: Officer Buckle Style! Happy Monday friends! We're on to community helpers this week and I ran across this great chart on Pinterest. I stinking L.O.V.E Officer Buckle and Gloria. It is one of my favorite stories to read. I thought this would be a great way to analyze characters and on "police day", no less. We have an officer coming to speak to my kinders in the morning. They are SO excited! 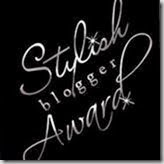 Rumor has it she's bringing badges for them to wear and other goodies. Anyways, I put together a little recording sheet to accompany this anchor chart. 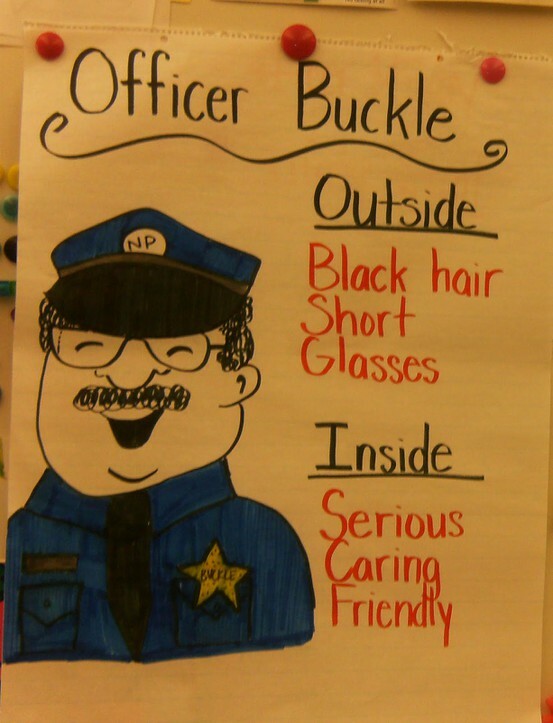 We will be doing an in depth character analysis on Officer Buckle and learning all about how characters vary from inward to outward appearance. Please note that the original idea for this was traced back to One Extra Degree. Be sure to hop on over to Amanda's blog and say hi! 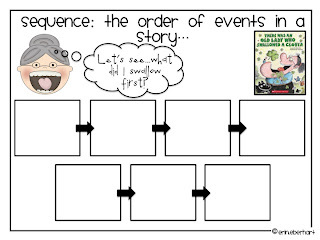 You can grab the printable for this cute chart below. Enjoy! Fame, Stardom, and a freebie unit! Hey friends! What a great and BUSY week! I am currently glued to the TV, taking in all the weather updates on the news. School dismissed early due to severe weather and tornadoes. That's right...crazy winds, tennis ball sized hail, and some funky lightening. I'm currently freaking out! We are NOT supposed to have stuff like this in TN, we are surrounded by mountains which I thought protected us. Guess not. Yikes. Nonetheless, I am home and gearing up to crawl in the tub...with a helmet! ha For real. Pictures to come. Now to write up another project. Ideas?! Afterwards, I was interviewed as well as one of my students. She was so sweet while they were suiting her up with the microphone. Clearly though, the fame and stardom has gone to her head. This is a picture of an autograph she gave our gym teacher today. ha ha Hilarious! She literally just wrote her first and last initial and then scribbled after it. I'd say...she's got the signature DOWN! 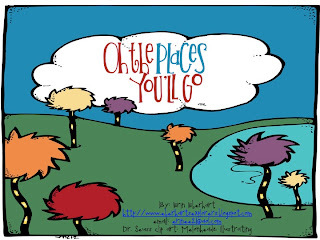 You can view the video by clicking the Dr. Seuss cupcake below. 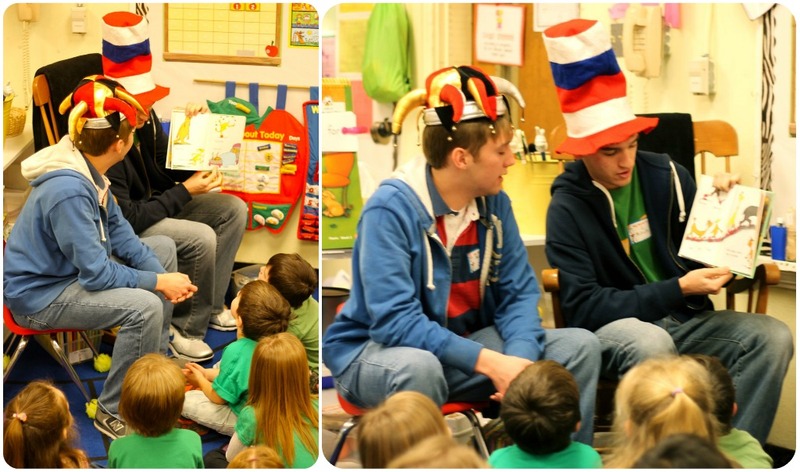 Here are a few fun pictures from our week. 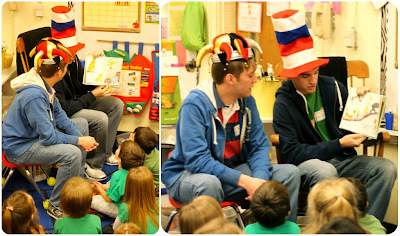 Thanks to our great readers from the local high school Beta Club. My kinders loved their fun hats and candy treats. We also made anchor charts, read books, did workstations, and all sorts of other fun activities. Hopefully, I'll post some more pics soon! Anyways...time to batton down the hatches. 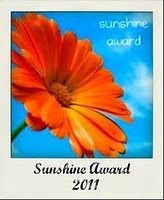 Grab this little freebie (hopefully it's not too late) and leave me some love. 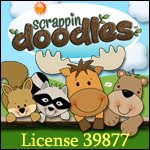 The clip art is from the fabulous Nikki at Melonheadz. 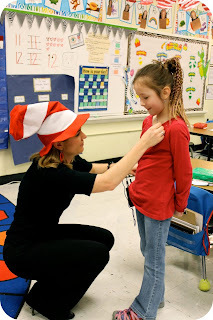 I emailed her asking for a few specific Dr. Seuss items and voila...they appeared in my inbox! She is amazing! And to beat all, she posted them on her blog and named the bundle after ME! What?! 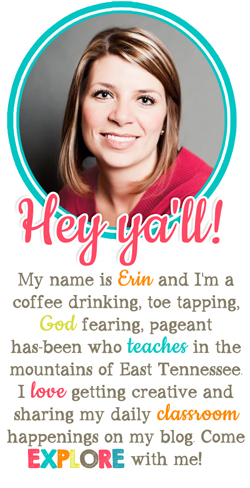 First the news and now clipart in my name?! 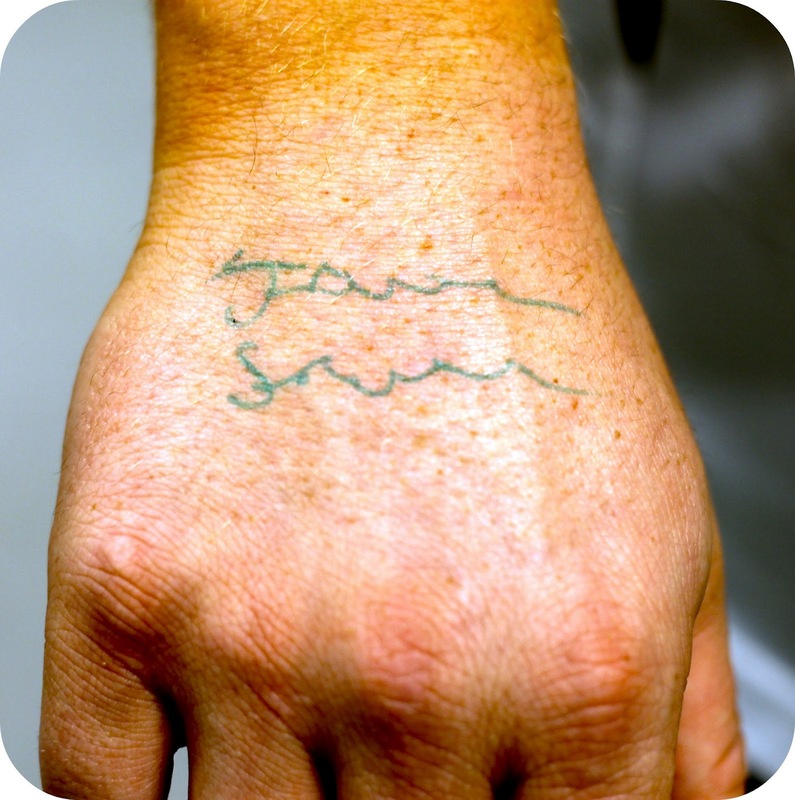 I may start offering autographs, too! ;-) ha ha I'm off to take shelter in the tub. Hugs!